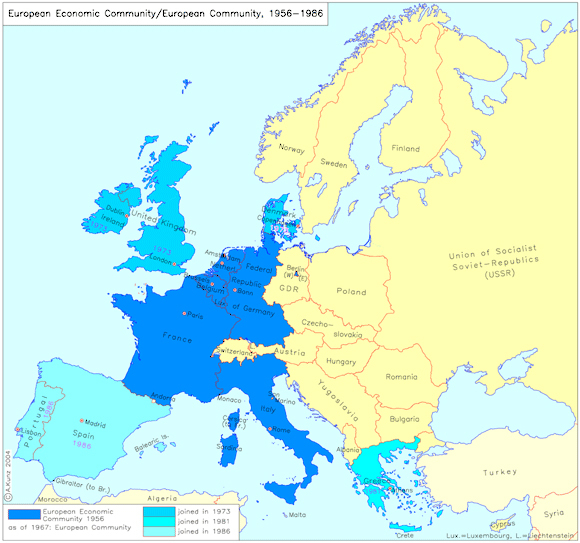 This map shows the development of today's European Union from its initial inception at the conference of the Council of Ministers of the European Coal and Steel Community in Venice in 1956 to the conclusion of the first "enlargement to the South" in 1986. The conferences of Messina (1955) and Venice (1956) were followed in 1957 by the Treaty of Rome and, after its ratification, by the actual founding of the European Economic Community (EEC) on January 1, 1958. The six founding members, France, the Federal Republic of Germany, the Netherlands, Belgium, Luxembourg, and Italy, are shown on the map in dark blue. In 1967, the EEC, the European Coal and Steel Community, and Euratom merged to form the European Community (EC). In 1973, the EC underwent its first enlargement with the entry of Great Britain, Denmark, and Ireland. In the 1980s, the total number of member states grew to twelve with the entry of Greece (1981), Spain (1986), and Portugal (1986). The EC countries are shown on the map in different shades of blue; the year in which they entered is also indicated. IEG-MAPS, Institute of European History, Mainz / © A. Kunz, 2004.